ACCOMODATION Alpine Camping - 2 Nights Hotel/Private lodge - 2 Nights. If one is looking at a short 5-day trek in the Himalayas then look no further. 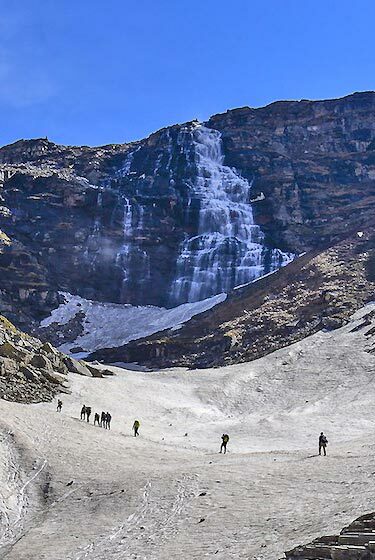 This is one of the most enchanting short treks and lies in the Garhwal region of Himalayas. 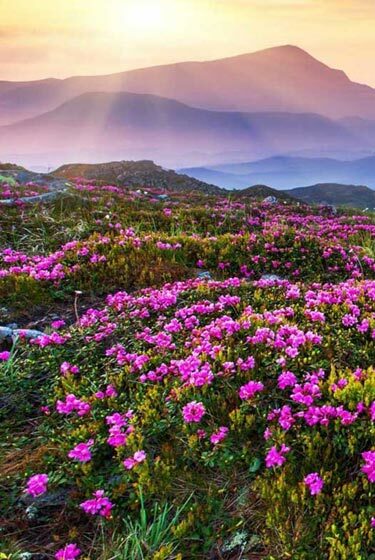 This hike is in a protected area and hence there are minimal signs of civilization and abundance of flora & fauna, which adds to the beauty of the place. In the first leg of the trek we hike up to Deoriatal. This is a beautiful lake at an altitude of 2438 m and has captivating surroundings with forests all around. 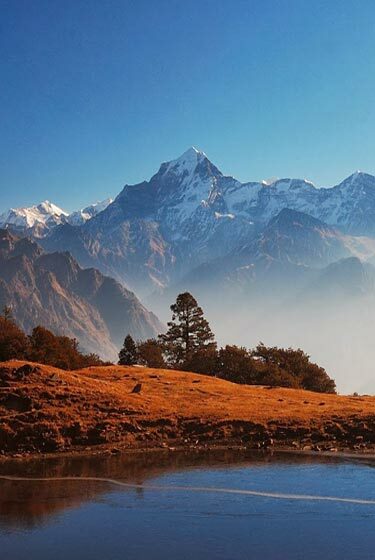 The Chaukhamba peak feels like it is an arm’s length away and the reflection of the mighty peak in the crystal clear waters of the lake creates a beautiful effect. The story associated with this scenic place is that when the Pandavas were in exile and were hiding from the Kaurava king, Duryodhan, they stopped nearby for a rest. When their mother Kunti felt thirsty, one by one four of her sons went to fetch water from this lake but died, as they could not answer the question put forth to them by the Yaksha Devta who resided here. When the eldest son's Yudishtra's turn came, he answered all questions correctly and with the result the dead brothers also came back to life. Here we will camp by the lakeside and enjoy the star spangled sky in the night. 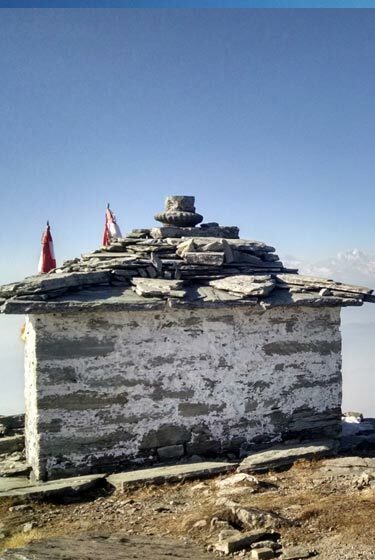 Next on our trail is Chopta, popularly referred to as the Mini-Switzerland of India because of its undulating green meadows (carpets of snow in winter!!) and a breath taking view of the majestic Himalayan peaks. Camping here is a totally enjoyable experience. We will meet at Haridwar railway station at 7:00 a.m and from here board a vehicle and be driven up to Kund. This is an interesting drive. You will, for most part of the journey drive along the Ganga & Alaknanda river before turning into the Mandakini valley. Enroute you will be crossing the holy towns of Rishikesh, Devprayag and Rudraprayag. Evening we will go for a short hike to stretch our leg muscles and also spend some time by the riverside. Overnight in the lodge. 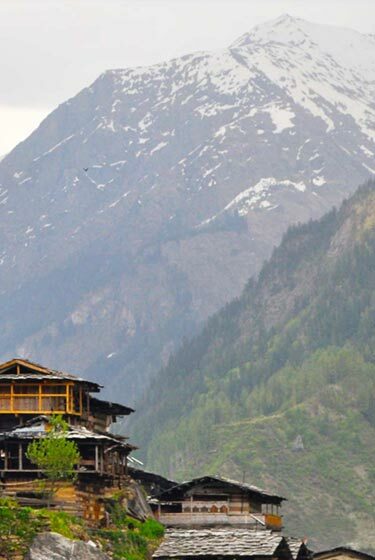 Today when you start hiking from the lodge you will initially walk through a few villages and a small temple town, Ukhimath. The walk from here on is through an enchanting mixed forest abundant in bird life. Today’s hike is mostly uphill. We will reach Deoriatal lake by afternoon and spend rest of the day exploring the serene surroundings. This is a fine place for photography and bird watching. Overnight in tents. getting views of other snow-capped Himalayan peaks. We will reach the campsite by afternoon and spend rest of the day exploring Chopta. The views towards the evening are going to be great so keep your cameras handy. The sunset from Chopta is also a photographer’s delight!! Overnight in tents. After breakfast those who want to try their hand at the exciting sport of river rafting will get an opportunity to do so. We will offer a stretch of rafting on Alaknanda river which is suitable for first timers also. In case someone does not want to raft they can enjoy at the camp by the riverside and wait for the rest to join them after rafting. After finishing the rafting we will depart for Haridwar enroute crossing the spiritual capital of the country, Rishikesh. Trip will end at Haridwar and one can proceed with the onward journey. We will reach Haridwar by 3-4 p.m. Trip ends here. 2 guides for the group of maximum 12 trekkers so 1 guide for 6 group members. This will ensure high safety and more information and personal attention which are necessary to appreciate a trek. All our guides are professionally trained and have any years of relevant experience in guiding treks. Accommodation in a deluxe mountain lodge in Auli on single/double occupancy basis (www.himalayanecolodges.com/auli.php). This lodge has an absolutely fantastic location and very good quality facilities and services. 4. All meals starting from dinner on Day 1 till breakfast on Day 6. A lot of emphasis is given to nutritional needs and a menu of vegetarian dishes is prepared accordingly. Tea/coffee will be served throughout. Do keep in mind that transport is a very critical component of your trek. This aspect is most often not given proper attention and can result in lot of discomfort especially in the mountains. We provide transfers to get you to the starting point and back as comfortably and in as less time as possible for you to enjoy the trip. We only use quality vehicles like Toyota Innova, Mahindra Xylo, Mahindra Scorpio, Tempo Traveller, etc. and no local jeeps or similar vehicles are used except where there are short transfers from the lodge to the trek points, etc. The transport tariff includes all driver charges, fuel, parking, toll and taxes. There are frequent Public Transport buses including Volvos available from Delhi to Haridwar that cost about Rs. 200-500 per person. These buses depart from Delhi ISBT every 30 mins. or so and take about 4/5 hrs to cover the distance. The same is also applicable on the return journey. A private vehicle could also be arranged for if you require the same. In the initial days of the pre monsoon season (April-Jun) there will be snow on the higher meadows and on the Pangarchulla peak. The snow start melting by early to mid-May so trekkers coming on this trail in April-May should be prepared for snow conditions. Days are going to be sunny and warm (12-20 °C) while the night temperature at the highest campsite would be in the range of -2 to 5 °C. In the post monsoon season (Sep-Nov) there is hardly any snow at the start with possibility of snowfall towards the end of the season, which also melts very fast. The days are sunny with temperatures hovering around (10-16 °C) and the evenings start getting cold with the onset of October and nights are comparatively colder (-5 to 5 °C). Wind-chill factor is something that one needs to account and be prepared for on most Himalayan treks.